Look at the scrumptious Sketch Lou has given us to play with over at Pollycraft Monday Challenge this week! Don't you just wanna play with it? And if you do, you could be in with a chance to win a whoppin' TEN Digi's from Pollycraft Designs. Waaaahoooooo! 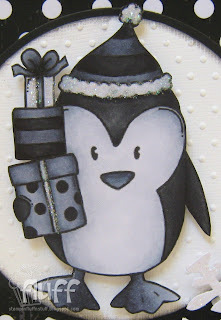 I've flipped this little baby onto it's side and used Dexter the Penguin - Gifts, which, is completely Plan B! Let me tell you all about Plan A. Plan A, involved an absolutely and totally illegal package. Not only did it get past Very Understanding Hubby and his Sneaky Telltale Accomplice and Side Kick, Sweet Cheeks, at Baggage Control HQ, but it also arrived in plenty of time to allow me to create a faberoony, heat embossed (actually, where is my heat gun?) Christmas Card. I snuckered happily into The Bat Cave to stroke my stash. Insert HYPERVENTILATING here, as said Christmas Stamp was not in package, due to being out of stock. OMG. I had some kind of virus for most of last week, and later that night, in a fever induced moment of Halucinative Clarity, I had the brilliant idea of making this card instead. Sorted. Which brings me nicely onto Backing Up. Or lack thereof. I have a little pink laptop, which, I lovingly refer to as The Cupcake. It's not often that The Cupcake and I are separated, only really when I'm shopping, and that's mainly so my hands are free to grab a bargain! It's pretty fair to say that I spank the hell out of The Cupcake, and although she's only one, she acts a lot older. Yesterday afternoon, when I was writing up the Cupcake post for Cupcake, mid post, The Cupcake died. The screen went black, there were some flashing lights and because Sweet Cheeks was out of earshot, I was able to fully express my disgust. Several moments later, after shaking The Cupcake and hitting it against the desk a few times, I defribrulated it with an Electrical Energy Source (AKA plugged it in). Whilst I waited (prayed) for the medication to kick in, I was allowed time to fully panic about what I was going to do if The Cupcake was, in fact, knackered, because I had no back up of any of the work I was in the middle of uploading. Very Understanding Hubby was typically manly in his advice. Check your AVG was his first helpful comment. Check the AVG. I know what AVG is, but where do I check it? After looking at the bar code underneath, I said something along those lines, so he came over, peered at the screen and told me AVG was fine. Good. Take The Cupcake for a service, was the next pearl of wisdom. Right. Service. Good plan. How long does that take? A couple of days. Oh, I think I feel dizzy, wait is that the floor in my face...? Ohmy goodness Fluffster!! 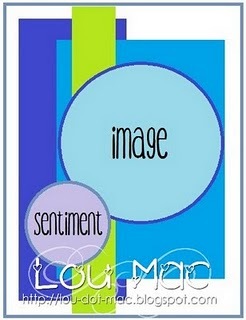 This is such a sweetand adorable card! Love the colours and pretty details! Boy,do i know the panicing feeling when your computer is having a meltdwn.... But so glad to see that you where able to write this post. Have a fantastic day! Hug and sunshine! You made me laugh with your story about your cupcake, although I feel sorry for you....mine had troubles too, but after service it came alife again.......your card is awesome...that stamp is so fun! !...love it!!! OMG, I'm having a sweat just thinking about my lappy packing up!! Noooooooooooooooo!! Your card is stunning hon, love the Black and White theme! Wow - this is gorgeous girl! Good thing you had something Christmasy in your stash eh?!! I am also happy to hear that all Cupcake needed was a plug in! I love your card Faye! It's super cute and gorgeous! I feel the same way about my wee laptop... we are very rarely separated and I drive my husband crazy if it ever has any glitches! I hope you don't lose all your stuff! Beautiful card Faye. I love the black/white combo. You had me laughing with your story - hope Cupcake is OK. Such an adorable card, I really love all the polka dots and the image is super cute and your colouring is awesome. Great details on the ribbon and the embellishment too. Your posts always make me smile, my laptop is on it's last legs so I keep everything crossed every time I power it up. I'm not sure how I'll cope once it gives up on me. The card is absolutely gorgeous Faye, I do like your colouring and take on the black and white. Hope the little pink cupcake survives! You are soooo hilarious Faye,...love reading your stories! Love your card too, black & white is always a favourite of mine. Hope cupcake is safely tucked up in her nice felt bedcover after the belting you gave her!! Luv Muver. Super cute B&W card. Love the penguins and all the polka dots!! Perfect for this theme! Lovin that B&W creation!! The penguin is tooo cute and Im always loving polka dots :) OH and those computers are designed to raise blood pressure and the most in opportune times you know, cuz they know we cant live without them! FAB card, you do B&W perfickly. wow- zers Faye, your card is so darn cute...LOVE your wonderful coloring!!! Big hugs gf! Mine is called Lappy like Jo's and is lovingly stroked daily ... i'm quite disturbed by your comment "I spank the hell out of The Cupcake" ... we are still talking laptops?!! Love your card, looks beautiful monochrome. You do B&W so well. Stunning!!! I hope cupcake will fully recover with no blackouts ! I'm a little jealous, I cannot sneak any stuff in here 'cause I'm not home when the mail comes and hubby is !!!!! what a fabby fun penguin card! I love this card so sort of glad you "had" to make it! And at least your hubby sort of knew what he was talking about, mine would be clueless! This is wonderful!! I love your image veeerrryyy much!!! Fabby papers and layout too!!! Had me giggling aloud...I have been having the same problem with my printer...it won't print blue...don't ask why it is just being picky!!! Love the card especially the penguin. So cute Faye! Love the dots! Glad your computer is running for the moment! It is a frightening thought to be with out one! Just think it was not that long ago when we did not even have these in our homes! 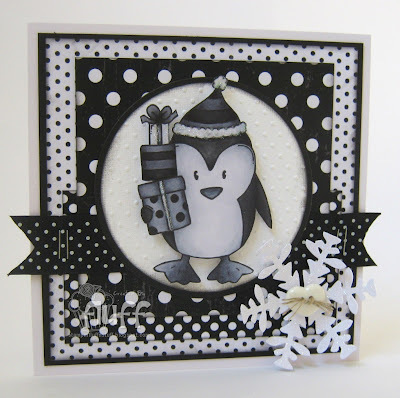 gorgeous monochrome creation Faye, it looks fabulous. I love all the polka dots! Oh WOW...this is GORGEOUS!! Love the monochromatic color scheme...I would have never thought that would work for a Christmas card, but now I have to give it a try! !